Each cabin has a fully equipped kitchen; full sized fridge, stove (with oven), microwave, toaster, kettle, coffee machine, pots, pans, dishes, and utensils. Good Simmons hotel beds, electric heat, running water. Bedding service available on request*. 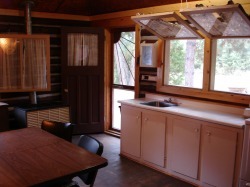 Each cabin has a firepit and picnic table. Campfire cooking is a great way to get out of the kitchen. Dry firewood** is available on site. Canoe rentals are available by the day or week. Campfire pots are available on request. Follow Ontario fire regulations. Use local firewood ﻿only﻿ for your campfire, available on site. **Do not transport wood into the grounds. Pest control is important for maintaining living trees and the microecosystem. Asian Pine Beetle, Emerald Ash Borer, Tent Caterpillar, and Gypsy Moth are all serious, identified pests. To date, infestations have been brought under control with vigilance and labour (no pesticides). Please, do NOT jeopardize the landscape for perceived personal economy. These are "housekeeping", also known as "self-catered" cabins. Please remember to leave it as you found it, and avoid service charges. Help keep the air, water, and soil clean. 27 years and counting of management nonpolluting practices; we appreciate your cooperation to fulfill our environmental mandate. Please leave antibacterieal soaps and products with microbeads AT HOME. Cabin 1 is for a maximum of 4 people. Double bed, double pullout couch. 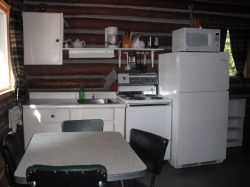 All log cabins have fully equipped kitchens and electric heat. Cabin 2 is virtually identical to #1. The two cabins have adjoining front yards, making a great situation for 2 families vacationing together, and extended families who want to be close. 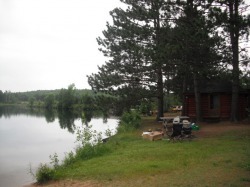 Cabin 3 is the cabin closest to the water's edge. It is for a maximum of 4 people, with a double bed and double fold down couch (davenport). 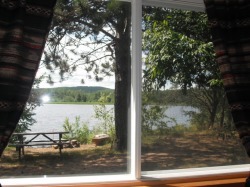 Cabin 4 is the largest, with 2 double beds plus a double fold down couch (davenport). All rates are based on double occupancy (=2 adults). Children under 18 are included to cabin maximum. Additional adults $20/night each. Please note, cabins are one room buildings with sleeping and cooking facilities. Washrooms are central, with flush toilets and hot showers. Pets allowed, $10/night. Please bring pet bedding and dishes. *Bedding service available for humans, $10/bed one time laundry (energy) fee includes pillows, sheets, and comforters. Please contact for cabin availability and more information. This property does not use booking engines and availability calendars. Etransfer (preferred), Mastercard, and Visa, accepted. A valid credit card is required upon check in for cabin security deposit.